It's a well known fact that New York City is a pretty dirty place. While the sidewalk grime gives me lots to sniff on my daily walks, my mom hates the way it turns my white paws gray. Therefore, about once a week I have to endure the torture also known as "bath time." 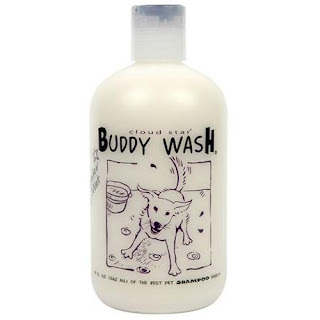 First she suds me up using Lavender and Mint scented Buddy Wash. I'd prefer something that smelled like dead animal or cat litter, but no one ever asks me. After the suds are rinsed, I get wrapped up in a towel and brace myself for the hair dryer. Next, she insists on using girly products like Plush Puppy's "Blow Dry Cream" and "Puffy Dog" styling mousse to make my coat soft and shiny. I've noticed she doesn't use as many products on her own hair, so I guess I'm special (or just high maintenance). Finally, when I'm all dry and my paws are back to white, it's time to sleep. Bath time is hard work, but somebody's gotta do it. Aaaack, he's so cute! If Stacy ever lets me get anything other than a Lab, I need a Henry. He's darling! Thats better shampoo than I use! He is so cute taking a bath!